Works are still available from Mel Kadel & Travis Millard's show here. Works can be purchased through Pay Pal buy buttons below. Photos of the works and also some pics from the opening night. On display will be 11 beautifully crafted oil paintings which are the next chapter of Los Angeles based Shawn Barber's "Doll Series". The "Doll Series" is Barber's response to living in a world consumed by popular culture. To Barber, it's been abundantly clear what motivates many young people in America especially since Barber has moved to Los Angeles two years ago to focus not only on his painting but to also open Memoir Tattoo with girlfriend Kim Saigh. With "Youth of Today", the "individual" personalities are saturated with a common ground- repetitive sadness fueled by the projected facade of synthetic surreality. 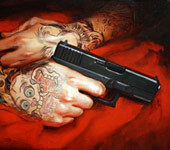 Shawn Barber's body of work focuses primarily on painting, portraiture, and documenting contemporary tattoo culture. Barber's intimate renditions of tattooed individuals balance both meticulous brush strokes and loose energy. Figurative in nature, these large paintings take on abstractions with explosive colors, meandering lines and paint dripping down the canvas. Shawn earned his B.F.A from Ringling College of Art in 1999 and has paintings held in private collections throughout the United States, Canada, Asia, Europe and Australia. His paintings have been exhibited in diverse solo and group venues including: The Joshua Liner Gallery, NYC, NY; Billy Shire Fine Arts, Los Angeles, CA; The Shooting Gallery, San Francisco, CA; Mesa Contemporary Arts Center, Mesa, AZ; University of Houston, Houston, TX. 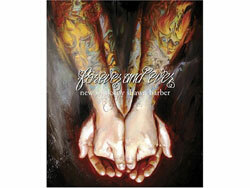 His first published book of art titled 'Tattooed Portraits' was published by 9mm Books in 2006, followed by his second tome, 'Forever and Ever', a 256 page hardcover book dedicated to the Tattooed Portraits Series. Shawn is currently working on a third book in the Tattooed Portraits Series with Last Gasp Books, to be released in July 2012. Among his extensive achievements, he has taught drawing, painting and the business of art for 10 years at various art schools throughout the country. After years of documenting the art of tattoo, it was a logical progression to pick up the tattoo machine and add tattooist to his resume. Shawn Barber opens Youth of Today featuring 11 new paintings on Friday, July 8th @FFDG (7-10pm) in San Francisco. Below are a few works included in the exhibition to give you a taste. He answers your questions and we visit his studio for a video interview. 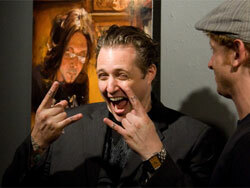 Featuring work from SF's Shawn Barber & Brooklyn based Vincent Castiglia. A look inside their studio as Shawn prepared for his solo show which opens in LA @Billy Shire on July 19th. Shawn Barber, Henry Lewis, IPath demo, LowCard, and Sheppard Ferry.